I would like to discuss the growth and transformation of our work with the BodyCartography Project since 2000 and how its core concept continues to inspire and feed our art making and our daily lives. For Otto Ramstad and myself it is both a physical, social and democratic impulse that draws us to unusual public locations moving ourselves and audience out of the proscenium and studio and out into the world. We use dance in public space as an act of transgression that reclaims the space for the purpose of personal expression and community dialogue and to heighten everyone’s environmental awareness. Within this process we share the tools of composition and dancemaking, educating the public about dance and therefore making the form more accessible. The language of improvisational movement and somatic practice, in particular improvisational composition, Contact Improvisation, Body-Mind Centering and Lisa Nelson’s Tuning Score, provide a training, a practice and a structure through which we meet the world. The world becomes our Contact partner. Our work is based in reality, based in the present, asks concrete questions, works with the puzzle of embodying place, research that could answer questions and develop strategies, simple and mystical at the same time. Through this we see how we are not necessarily generating a particular style of movement like traditional choreographers but instead generating a practice and methodology, a mode of perception and way of relating to the environment which can be embodied within many different styles of movement or media. In September 2001 we transitioned from living in the Bay Area to Minneapolis. We let go of working and dancing relationship with many close friends and collaborators. People whose weekly participation had created the foundation of BodyCartography’s work. We also committed to working in New Zealand each year to expand our artistic horizons and support the local improvisational dance community. We move between the NZ’s young, inspired and hungry improvisational dance community and spectacular landscapes and the cultivated, articulate and maybe sometimes jaded community in the USA. In the current climate of fear, dis-empowerment, censorship, funding cuts, crass consumerism and lack of environmental awareness, it is not hard to find motivation to make public and environmental art in America. It is harder to fund it. This urgency is not felt in the same way in New Zealand’s urban centers. Not that NZ is free of consumerism and bad politics, but it’s physical beauty can sometimes function as a great distraction to building an art or an art audience. It is comparatively middle class and of liberal politic compared to the USA. Currently it’s three top political positions are held by smart women. There is a valued place for the arts in education and public life. People are not culturally starving in quite the same way as there are in the USA. Organizationally Otto and myself are co-directors of the Project. We work with independent artists who are usually local to the sites in which we develop the work. We have ongoing relationships with dancers, musicians and videomakers in Minneapolis, New Zealand and other parts of the USA and Canada. Our current work is generally self-produced, funded through grants or residencies or self-funded. We are also commissioned by other companies or communities to come and create work in their cities or towns. In 2001 at Otto’s initiation we shifted our focus from creating spontaneous improvisational events in many different locations to working in one site for a longer period of time to develop a publicized performance event that could occur over several nights. With this shift came the need for permits, rehearsal wages, publicity and good weather anxiety and sometimes insurance and rain weather dates. The benefits of working daily in one location for a month is the depth of understanding time builds. Sometimes initial desires still make sense, sometimes new ones develop as you watch the environment with weather, animals and people passing through. Working on site also develops audience. We have found this traditional format very successful. For the moment we have satisfied this desire. A recent performance in the Wellington harbour (NZ) titled Lagoon involved fifty performers including nine musicians and composer Michelle Scullion, We worked at the site for seven weeks over the course of two years. We had the cast size, time and technical requirements to really meet the needs of the space, attracting an audience of over 2,500 people over three nights in March 2003, and receiving the top award at the NZ Fringe Festival. In making place-based work the site determines the nature of the performance, whether it requires a small or large cast, how improvised or structured the choreography will be, whether music or lighting is necessary and how sophisticated the costuming will be. With Lagoon we realized that working in a site this large we would loose many of the personal movement details. There is less room for the idiosyncrasies of improvisation. 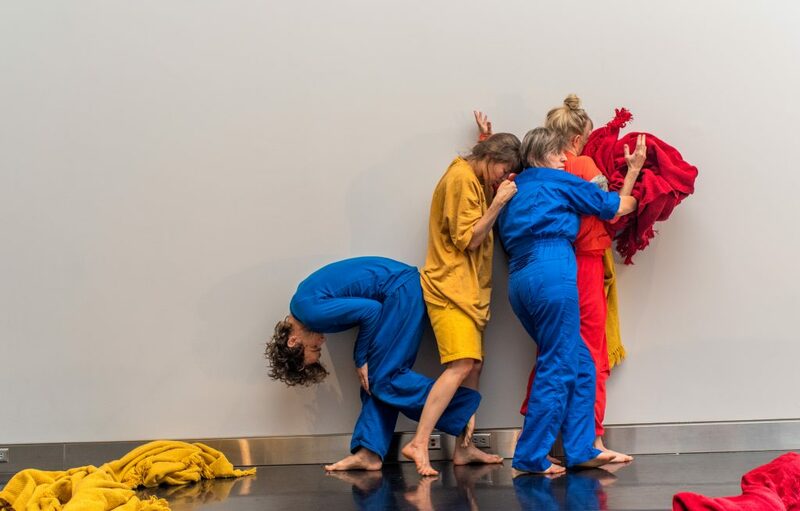 What the dancers are experiencing and trying to communicate sensorially does not read in such a vast space unless it was really big and clear. The power of the process is used serve the product. In Lagoon this communication had to evolve through a chorus of people working with the same material creating patterns through the space, through the use of lighting to frame a moment or individual images that were unusual, powerful or humorous. Two examples of this last idea; Kilda Northcott, wrapped in vast swaths of plastic, a bundle of flowers on an invisible floating platform drifting across the lagoon as the trash queen. Wilhemeena Gordon suspended on a vertical wall, lit by a follow spot and improvising with an identified movement phrase. Our current new thirst is in working in more unusual locations. Working with video has made this possible in that we are able to work in remote non-urban locations. We are then able to create video dance in locations where live performance might be impossible or less accessible to the public. The video becomes a bridge to another place and also a bridge to a live improvisation to take place after the screening. We are directly merging our documentation with our art making, our process and with our product. In January 2003 we developed our first work in a wilderness location, a mountain, Wharepapa/Mt Arthur in Kahurangi National Park in Aotearoa/New Zealand with support from Creative New Zealand. The second phase of the project was to bring the film to public spaces in the small towns close to the mountain and teach movement workshops. Artists involved with this process included New Zealanders Wilhemeena Gordon, Alyx Duncan, Gabby Deighton, Levity Beet, Mike Baker, Fiona Gillespie and Australian Jade Dewi Tyas Tungaal. The choreographic development and filming were the most enlivening and exciting phase of the work. Living on the mountain for nine days with nine dancers. Three of us, Alyx, Otto and myself, shot and edited the film and also feature in it. Negotiating weather, location, cooking and dancing together. The variety of geological variation in this area is huge and inspiring and engaging for dancing. The hut that was our base camp is two hours hike from the carpark from which we carried in all our gear. Each shooting location included another two to four hours of hiking per day. In the time period we were there we experienced rain, huge wind, snow and hot blazing sun. Each created a different challenge physically and choreographically and logistically. How to shoot in gale force rain at the same time dealing with issues of potential hypothermia of semi naked dancers? Everyone was invested in the development of the material. As we explored the external surface of this mountain we were conscious of our own skin covered surface, the icy wind, sun and rough rocks in constant interaction. Some days cold to our core or sweating everything as we climbed tumbled and danced through our muscles, bones, and fluids, reeducating our reflexes at every turn of a rock. The environment itself was some days so physically challenging there was never a questions as to why we where doing what we were doing. Survival played an equal role in shaping the choreography. As a result our work became not only site specific but also weather specific, seeking these different atmospheres and qualities of light, like a lizard finding a warm rock, alongside the sheer urgency of completing something before the ensuing storm. “I learnt about power from being affected, inspired and moved by the extreme qualities of the elemental forces on Wharepapa. Each days journey to various locations felt as though the mountain was weathering my vulnerability as a human, and in doing so I desired nothing less than to be moved by my exposure to the wind, rain and sun. Camping and tramping are unfamiliar to me but they provided the ingredients for a wonderful adventure. Noticing the changes in my body-mind from being without heated running water, electricity, urban pollution guided me towards feeling my spine and its response to my different survival situation. I was often in awe of my notions of freedom as I was surrounded and held by the respected and protected wilderness of a National park. It was a wonderful joy to be cultivating daily, the courage to be present to the beauty and danger of Wharepapa’s living natural architecture. Then using that fearlessness to be creating dance in the green moss space, from the white daisy space and of the gray rock space – becoming a reflection of a brittle blue sky. A dialogue developed around methods of shooting. Methods included working with a more traditional format of shooting a wide shot, medium shot and close-up of the action or shooting from a set frame and then shooting from the perspective of the dancers and working with more moving camera work. The latter offering more opportunities for individual improvisational movement. Both methods manifest in the final version. The less formal method seems to have more durability over time. It is no coincidence that dancers make great camera people through their study of movement and practice of framing. For our tour we decided to show the film and then perform afterwards. A developmental strategy by asking the audience to tune their attention first to the rectangle of the projected image (familiar and contained) and then shift to the multifaceted performance (unusual and global). Eight dancers from the film were present. The performances were improvisational structures developed from our work together with the Tuning Score. The score uses spoken word to tune the action. Sometimes we worked with live music or with local DJ’s. People familiar with more traditional narrative forms (ballet for example) watched the video and found themselves excited and satisfied with our non-narrative style. For some, the video is more accessible than live work of the same nature because the shifting dramatic landscape in the video is engaging people for a longer period so they come to understand or are more open to what is going on. For some the live performance is more engaging because they can see the feel the dancing relationships present in close proximity. In one event we screened the video on the wall of a café and then turned the audience around and performed in their carpark. People were struck by the reality that dance can be inspired by any environment, including there own city. The mountain is enlivening, a contrast to where most of us live. It is physically engaging, bringing one out of one self and in to one self at the same time. For many of us our exposure to wilderness is very limited. Here we are being danced by the weather and the sheer thrill of the environment. And then there is the café or carpark in which we performed. A place where people go maybe once a day. It is more familiar. Maybe a place where one’s focus is more internal, where there is less attention placed on the space. Here we need to do more work to open or narrow our perception in order to engage our attention on this space. Our focus as audience or performers becomes more people centered. Group composition is everything. This is live with no chance of editing. 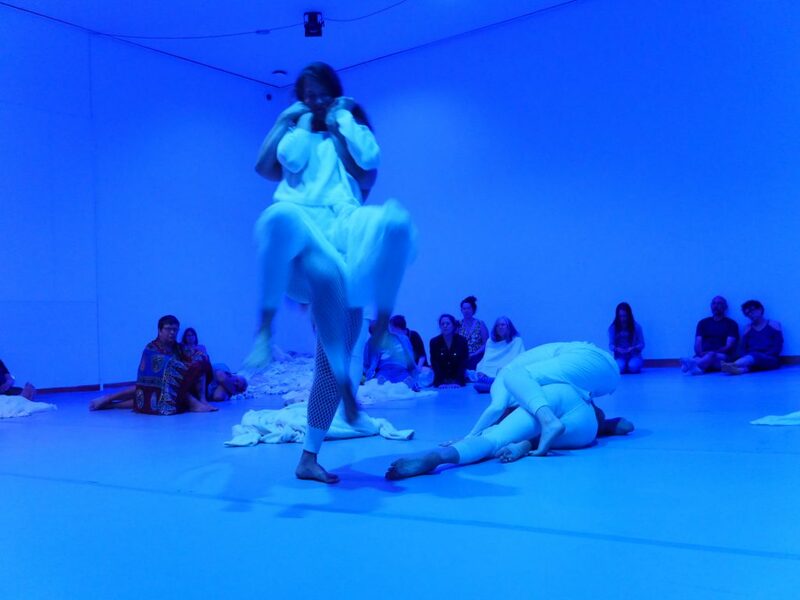 A car drives through the middle of the performance space, the dancers push it off stage. A herd of young drunks descend from the roof of a building on the other side of the parking lot and are drawn into the performance and then led into clambering (soldier style) over a car before disappearing in laughter off into the distance. Through the act of framing a space and through the dancers compositional choices our attention is drawn out to the environment. Here nothing is taken for granted, every moment is witnessed and nothing is considered solely a coincidence. This possibility allows us to experience the world or this place anew exposing its mundanity and its sacredness. We see working with the video camera is a natural progression for us. In making site-specific work we are highly focussed on defining our audiences frame, because there is no proscenium. With video we can do the walking for the audience, we are not asking them to climb the mountain or squeeze into tiny dirty space to witness a dance but take them there none the less. These projects have widened our audience base to include not only the dance community, but a vast section of the general public, the video/film community and school children. Audiences from the tour were highly engaged and developed fresh insight and excitement about dance, the mountain, the environment and their relationship to it. Having a product that exists on video means that our work can now tour without us and reach into other public venues such as film festivals and the privacy of peoples homes. We have come to realize that the BodyCartography Project is like a meta practice of exploring public space and social interaction with our bodies/mind and a sense of humour, be it through film, performances (both formal and unconventional), dialogue, workshops, documentation, process or product. Olive and Otto will be leading place-based dance and dance video workshops and projects in New Zealand, Minnesota, Earthdance and beyond in 2004.